LTE’s smallest bench-top freeze-dryer has a digital temperature display and an impressive ice capacity of 3kg (2kg in 24hrs). Taking up minimal bench space, the Mini-Lyotrap is ideal for all common freeze-drying applications and can also be used as a cold trap for single or multiple units. Min Temp -55°C. 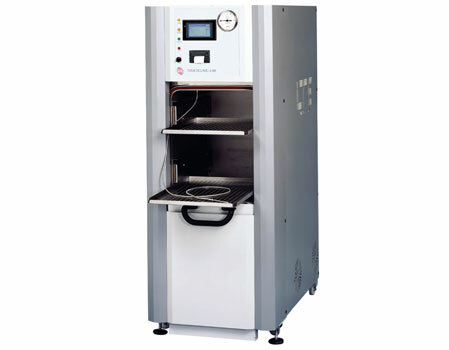 Acrylic drying chamber, 300mm dia x 400mm high. Aluminium 6-shelf unit 270mm dia. For acrylic chamber. Excludes trays. 8-port flask manifold lid, excluding quickseal valves. Cold trap lid with hose for solvent recovery or vacuum pump protection. Drying chamber plain lid, 310mm dia x 20mm thick. 8-port column manifold with lid attachment, excluding quickseal valves. 16-port column manifold with lid attachment, excluding quickseal valves. Trays for closing device or shelf unit, 230mm dia. Temperature-controlled heater mat arrangement (6 mats). Stoppering shelf arrangement, excluding acrylic chamber. Lid with 48-port ampoule manifold. Lid with 96-port ampoule manifold. Spin Freezer, including 1 set of carrier plates. Additional spin freezer carrier plates. 1m vacuum hose and clamp to fit Lyotrap, plus KF25 hose for vacuum pump. 2-off “L” section rubber gaskets for drying chamber. GVPDK 10 vacuum pump + oil mist filter.